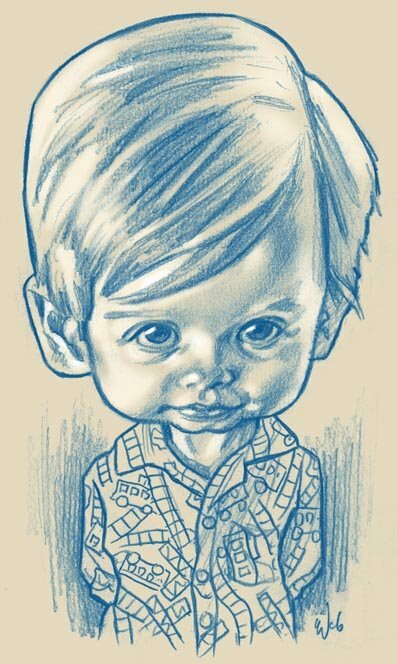 A sketch of my son and special little guy, Alexander. ...and yes, he's as cheeky as he looks. I've added Alex to Illustration Friday's current topic, 'Angels and Devils'. As with all kids, most of the time he's the perfect little angel but he definitely has his devilish moments. On a different note, this is my 50th blog entry, 50 days in row. Hope you're all enjoying the ride. your old material is new to us, well at least to me. so keep it coming. lovely little sketch. :) congratulation on your 50th post. you're almost catching me up! again you're a updating blogging machine! Let me know how the portrait goes, Patrick. This is so much better than just taking photos of your kids. Just as well, I'm hopeless with a camera. Chris, wonderful drawing. Great idea! What is the medium again? rrramone, makita, chuang- Thanks for your comments. The medium is pencil and Photoshop. Impressive Technique! Great skill with colour pencils! Ha ha!! Great drawing--cheeky indeed!! He look adorable, but I can see that he has another side...just like all children! Congratulations on your 50th entry...you're going strong! Thanks everyone for taking time to comment. Shigues- It's not coloured pencil, but just grey graphite pencil colourised in Photoshop. Gives me a bit more control on my colour choices. so simple and perfect, yep! You got it, he looks like an exceptional boy. Really captures that endearing impishness! Thanks for your comments natura, lois and scribblesk. Very much appreciated.